From the Self Help Graphics website. As nonprofits grow or decide to scale up, they often face significant decisions about their physical space, including whether to buy or keep renting. NPQ has looked at this conundrum many times, and one of the most critical questions to be answered is about budget size and the amount of slack within the budget. Buildings impose fixed costs within your budget structure, and those can sometimes crowd out program and budget flexibility. Often, this is too great a risk, unless the building has an undeniable mission-centered rationale, which in this case it does. Boccalero and printmakers Carlos Bueno, Antonio Ibañez, and Frank Hernández, among other artists, started the programs in 1970 with a used printing press behind the nuns’ home. They moved three years later to a space donated by the Order of the Sisters of St. Francis in Boyle Heights. The archdiocese sold that property in 2011, and the nonprofit moved again and had to pay rent. They have moved three times since that garage beginning. The organization’s revenue for the fiscal year July 1, 2015, through June 30, 2016 was $479,562. For the last ten years, the total revenue was $4,024,304, with an average of $365,846. That income has paid for programs and overhead, but there is no room for a mortgage on a southern California property. In 2014, Self Help Graphics & Art approached the City Council and the Board of Supervisors with a plan to purchase space, hoping for financial backing and, with it, public support for the location. Los Angeles appraised the property, owned by the state of California, at $3.625 million. 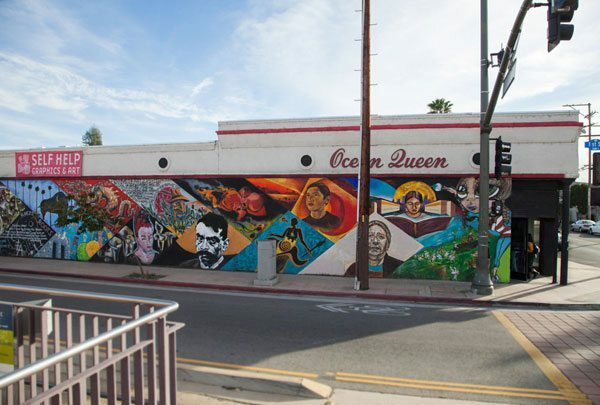 The nonprofit must have made a strong case, Councilman José Huizar, and Los Angeles County Board of Supervisors (under Supervisor Hilda Solis) voted in late 2017 to help the nonprofit purchase the building with a combined $1.28 million commitment. Self Help secured $2.8 million to invest in the purchase through a $2.05 million loan from the California Community Foundation and a $250,000 loan from the Weingart Foundation, as well as two $250,000 grants from the California Community Foundation and former board member Zac Guevarra. Now others can share the experience of past program participants like Arleny Vargas. She first attended a self-defense class before her junior year in Wellesley College and has taken a five-week workshop—Soy Artista, Spanish for “I’m an Artist”—that includes photography as well as stencil and silkscreen printing. The first in her family to attend college, Vargas is now a senior, working on a career in photography. The organization assists the community in other ways. The printers used their skills to produce materials for the Women’s March in 2017 and, this past September, placed a miniature printing station in the parking lot to make posters in English and Spanish to provide instructions for anyone stopped by Immigration and Customs Enforcement agents after DACA (Deferred Action for Childhood Arrivals) was threatened. There are many ways to help as midterm election day nears. Some are collective, but others simply require inspiration and an understanding of need.